I needed some more and in particular solid color options of this earrings. And if I weren’t too lazy to take some screens, I had shared them earlier with you. I hope, you’ll like it. These are the last socks for this year’s X-mas, you have my word! And I can say for now: You are best prepared for cold winterdays … and your sims will look good! This took me so much time and nerves! There were many times I wanted to give up, but now it’s finally finished. It’s not a perfect EA recolor, but it’s the best I could achieve. Brownsalt and Blacksalt are from the original hair. I included them, because I like the full 18 colors standard list. Not basegame compatible. You’ll need the “Get Together” expansion pack! More preview pictures on my Tumblr! Even if you won’t have a white Christmas, your sims should wear something nice against the cold. This clothing pack gives you what your sims’ hearts desire. Make them feel warm, comfortable, looking awesome and feeling christmassy. Merry Christmas! I like this rug from Get Together, but it has these group icons on it, which don’t look nice in every room. So I removed them. This is not an override! You’ll need the “Get together” expansion pack! Standalone! It’s no override / default replacement! There are so many flippy and peppy teenager out in Windenburg, I needed something colorful and transparent for them to look pretty in the clubs. Happy new year, everyone! Please fogive my possible bad English, I’m still a bit drunk. But I wanted to share my new year’s fan stuff pack with you today. 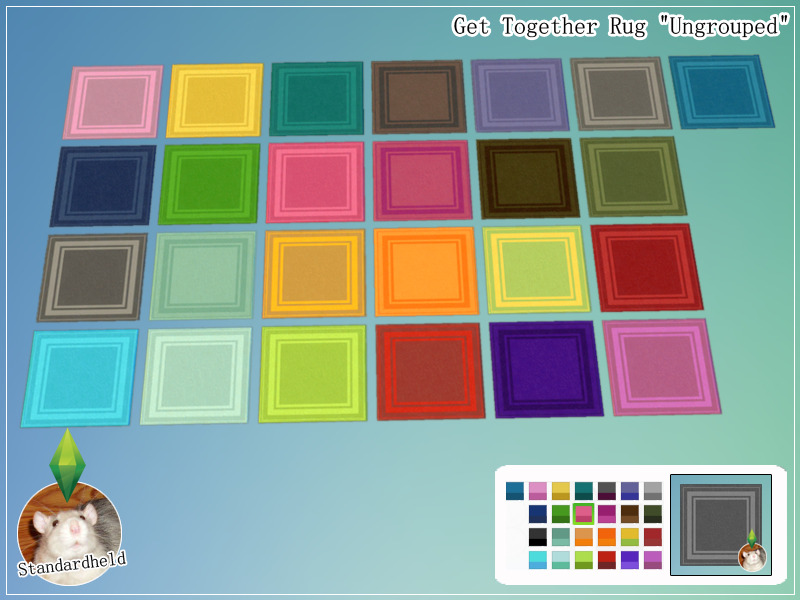 This time there are no clothing recolors, but rugs! I used the nice texture from the Get Together group rug - without the symbols. Basegame compatible for all except the “square” rug. This one needs the “Get Together” expansion pack. I just wrote sunnyflowersims from the simblr community that I need one more follower to reach the next milestone and then there is awesome booster-sims following me! And to make my day just perfect, my 400 followers gift is my 200th tumblr entry, yay! I don’t know all of my followers, but I’m really happy they all (and, of course, the people here, too!) like my stuff so much. Thank you all! I’m in love with you, I look through rose-colored glasses. So there had to be glasses as gift. Have fun! This was one of two request by pwettyderpypenguin. I could not decide if I should do this shoe with the original sole from the EA mesh or with a solid one, colored like the rest of the shoe. So I made both. I hope, you’ll like. Two versions: Solid color or with a brown sole. You can have both in your game. This was the second request by @pwettyderpypenguin and I’m very satisfied with the result. It looks really cute. I’m glad, I am able to upload this today yet. 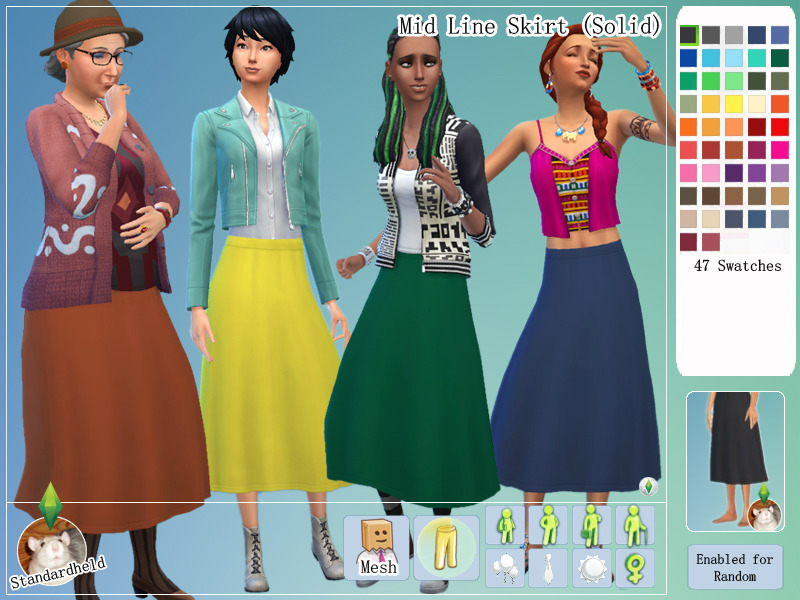 I’m so in love with SimLaughLove’s Midi A-line skirt, I had to recolor it … and noticed, I gave my recolor a wrong name, but who cares? It’s beautiful, I love it! Enough said! Here you go. NEED MESH! GET IT HERE! This was a special request from akashi4 who wanted this knitted dress in pastell purple colors. I did my best to create as pastel as possible for me. I hope you’ll like. 2 versions: Standalone and/or additional swatches ~ you choose! This was another request by akashi4 (from Tumblr) to have hair colors matching my “Lavendel” dress. I think this will be the only recolor of alpha hair from me, because I personally don’t like them in my game and it’s not that fun to recolor them like clay hair. So, have fun with this unique piece of CC from me! More preview pictures at my Tumblr! When I got the Movie Hangout Accessory Pack and saw this cute tank top for the first time, I decided to recolor it. Well, from this idea arose another whole stuff pack. This time just for your females to look good in bed. Have fun! 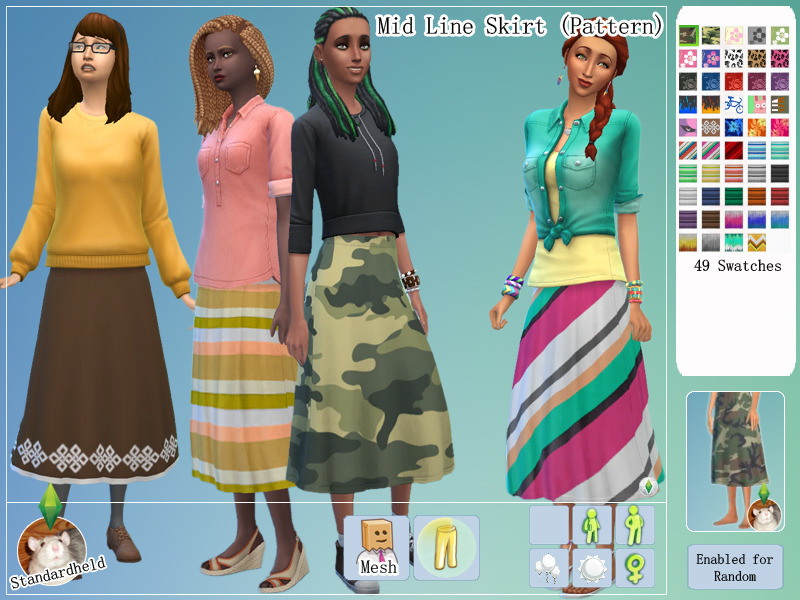 6 different clothes with differend textures ~ 13 files on total!